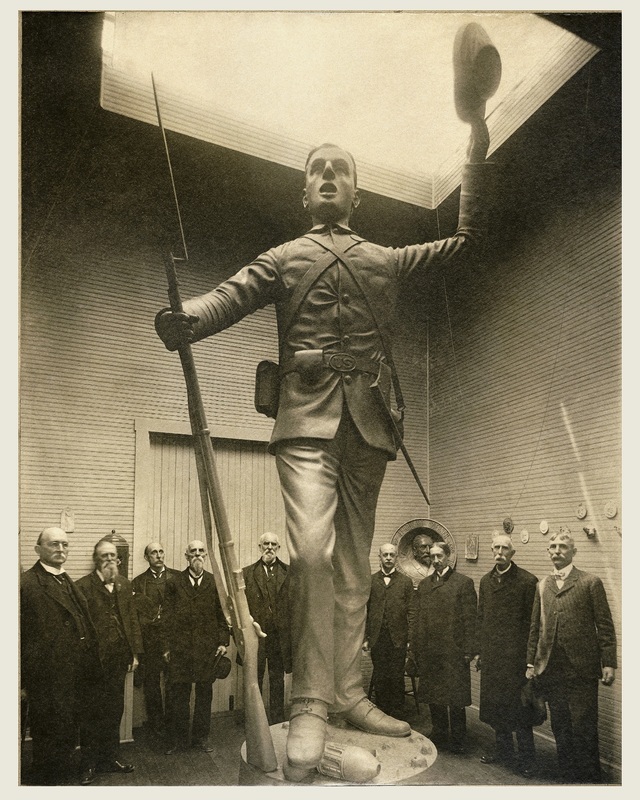 also known as "Victory, Jewel of the Soul"
Rudolph Thiem’s masterpiece is a seventeen-foot-tall bronze statue of a Civil War citizen-soldier (1904). 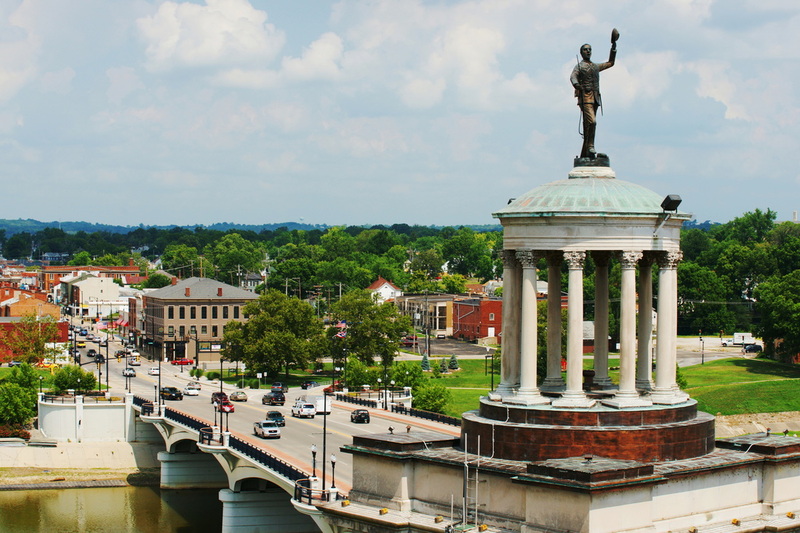 It crowns Soldiers, Sailors and Pioneers Monument in Hamilton, Ohio. The monument rises above the Great Miami River at High Street Bridge. The sculptor named the statue “Victory, Jewel of the Soul,” but people today usually refer to it as “Billy Yank,” the nickname given to the Union foot soldier of the Civil War. “Victory” was an innovative work. It makes a bold departure from the run-of-the-mill figures of Civil War soldiers found on memorials of the time. Unlike the typical “memorial soldier,” who stands unmoving and stationary—at parade rest or in the sentinel position—Thiem’s bronze figure is dynamic. This made some citizens uneasy. They found the soldier’s stance too informal. The musket did not rest on his shoulder, and so forth (Blount, “Ear-shattering ritual . . . .” F-1). Shortly after the statue’s placement, Thiem responded to this objection in a newspaper letter. His words reveal what he intended in shaping the figure as he did. The soldier . . . is not saluting, but shouting; he gives the expression of victory and in such a supreme moment all regulations are forgotten: in this spirit the design was considered and accepted by the committee. If I had designed a soldier in the attitude of a salute he certainly would have been in conformity with the regulations of the U.S. army in force during the Civil war, but as he gives the expression of victory he knows no regulation at that joyous moment. I hope that the citizens of Hamilton will look at this question from this point of view. The war is not over. The youth, swept up in the emotion of a single military success, stands on the scene of battle. He has placed his foot on a spent shell. The war is not over, and the young man may yet be killed or maimed or captured in upcoming actions. Viewers of the statue do not know what will happen to the soldier, nor does he himself. His future lies in shadow, in the unpredictable dangers and outcomes of the continuing conflict. Thiem’s design reminds us that many soldiers who died in the Civil War were barely old enough to be men. The statue is quite unusual in singling out this age group and paying it homage. The sculptor may have been thinking of his own son, “Rudy.” He was five years old when the piece was conceived. Some day the boy might have to risk his life in another war. Rudolph Thiem sized the statue so that it would stand in a proper and harmonious relation to the monument below it. He designed the figure of the soldier to be seen in the round, from a variety of angles. The proportions and composition of the large soldier create striking silhouettes from the four quarters of the compass. Whooping it up is what makes the soldier a notable figure in that day and age. He is shouting “hurrah.” To capture the soldier’s expression, Thiem modelled the face in clay while looking at himself in a mirror and shouting for joy (Blount, “Nameless Private. . .” 36). The artist transferred to the wet clay the image, lines, and musculature of his own face, transformed by strong emotion. Billy Yank represents no one person in particular, and yet his face, unlike so many “memorial soldier” faces, is not generic. It has features of Thiem’s own likeness. The private thrusts his cap into the air. He shouts. Such exultation over a battlefield success was true-to-life, but it was not often depicted in a Union soldier statue. At the time, sculptors and their sponsors felt that emotional expressions of victory rubbed salt in the wounds of Southerners, who were, after all, the losers. 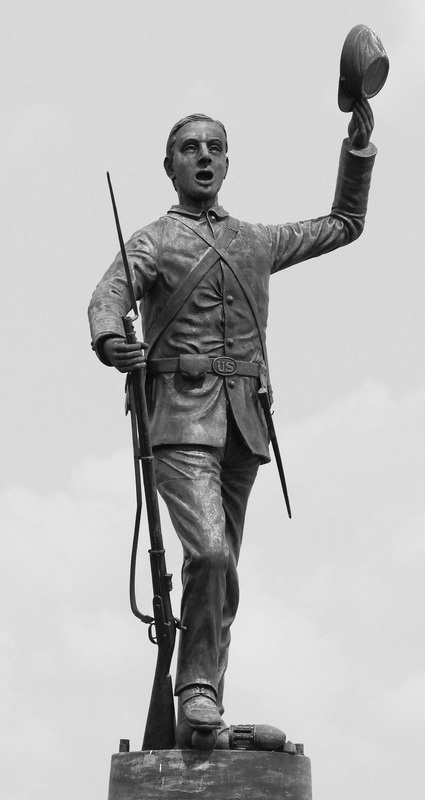 Thiem’s design clashed with the idea that “memorial soldier” figures should be reflective rather than jubilant. It was believed that the restrained “Billy Yank” statues of the time, by not ruffling Southern sensitivities, helped heal the wounds and bitter feelings that still divided North and South. This thinking lay behind the routine designs of memorials put up in numerous town squares. Hamilton’s Billy Yank is exceptional in another way. This soldier is a mere youth—not the seasoned trooper seen in most memorials. Lack of facial hair is the marker of his youth. In fact, mature Union volunteers sported mustaches and beards. A news reporter, on seeing the clay model displayed in Thiem’s studio, described the statue as “a young Amerian volunteer soldier, a beardless youth of 20 or 21 years of age . . . .” (“Theim’s Victory Figure” Republican News, May 7, 1904, p. 7). The youthfulness of Thiem’s Billy Yank is well-suited to his boyish elation. Adolescence and joy over a “battle won” give the statue a strong story element rarely found in other town memorials. It is clear that the soldier’s joy is not for the end of the war, but for a single battle won. As a contemporary reporter, who interviewed Thiem, put it, the soldier is “in the attitude of rejoicing over a wartime victory” (italics added, “Thiem’s Life . . .” p. 5). The figure is a hundred feet in the air. He is part of the sky. His stance and gesture are so cleanly articulated they create a bold outline, even when seen from a considerable distance. The perfect siting of the statue on the edge of the great river made the soldier highly visible. The riverside location helped ensure the statue’s legacy in another way. Nine years after Billy Yank was raised to the top of the monument, he witnessed, and survived, the terrible flood of 1913, which killed hundreds of people in the county. 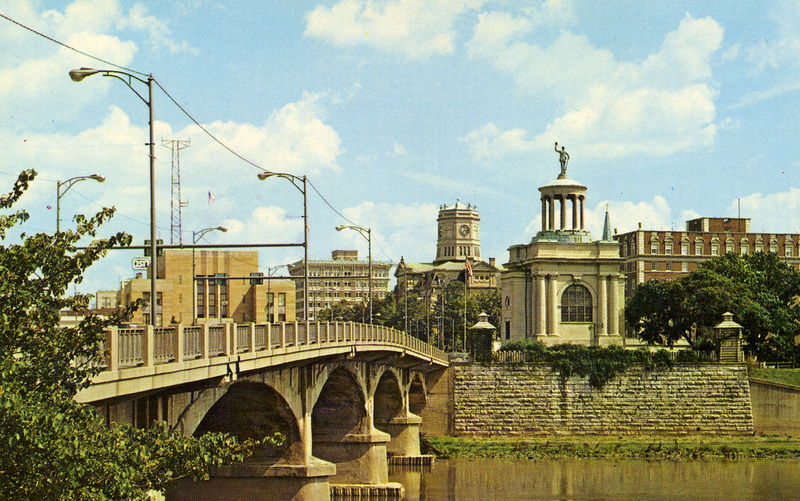 A contemporary photograph pointedly shows the statue standing unharmed above a scene of wrack and ruin—the bridge over the river utterly destroyed. Two years later, a photograph from 1915 includes Billy Yank watching over the construction of the new bridge. For Butler County citizens, the nameless soldier became a symbol of human endurance. 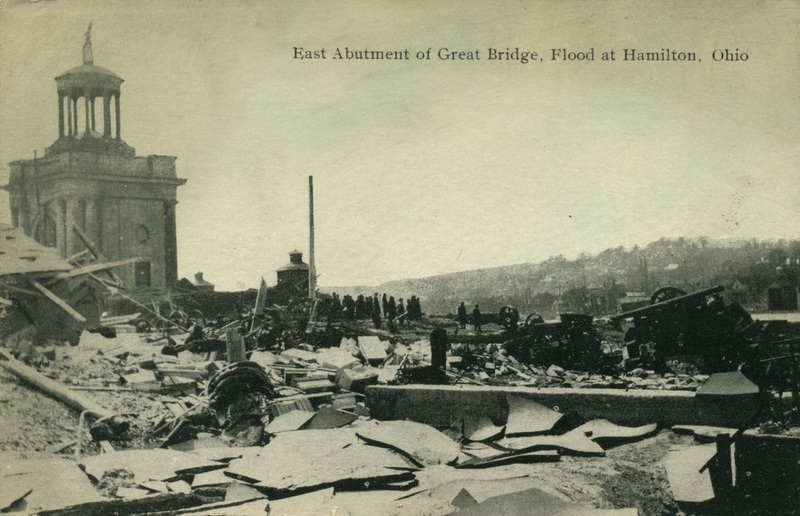 Postcard, East Abutment of the Great Bridge, Flood at Hamilton, Ohio, 1913. 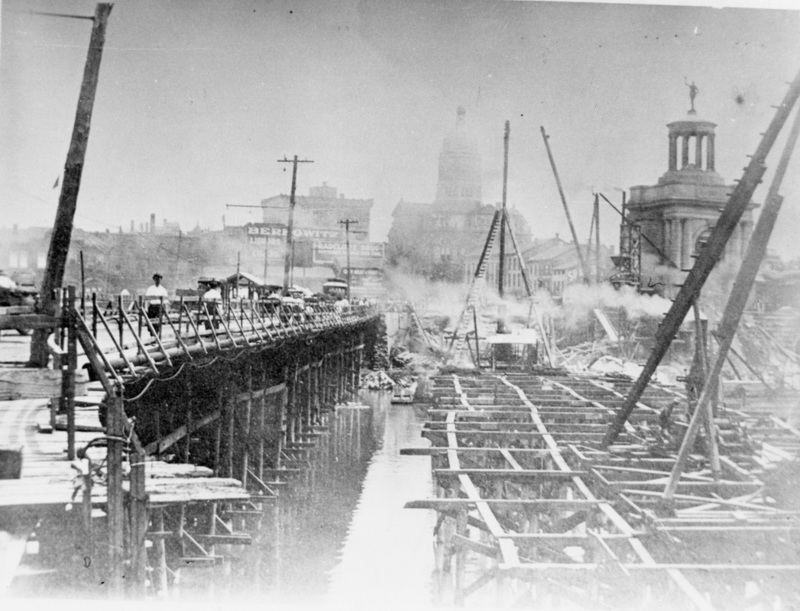 Construction of the new bridge, 1915. Photo used courtesy of the George C. Cummins "Remember When" Collection at the Hamilton Lane Library. When World War II ended, an enormous V for “Victory” was hung on the monument crowned by Thiem’s Victory (Blount, “Ear-shattering ritual,” Journal News, Feb. 24, 1980, F-1). 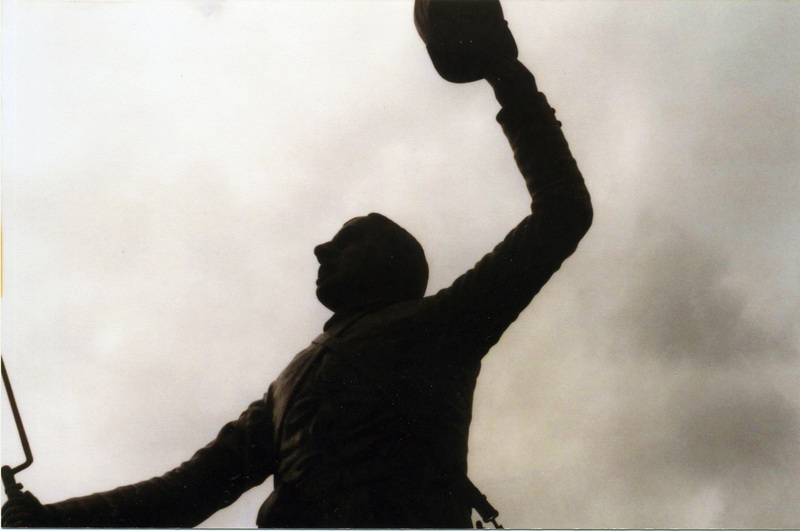 Later still, the silhouette of Hamilton’s most beloved statue became the logo of Butler County and part of the city’s official flag (Blount, “Nameless Private,” Journal News, 36). 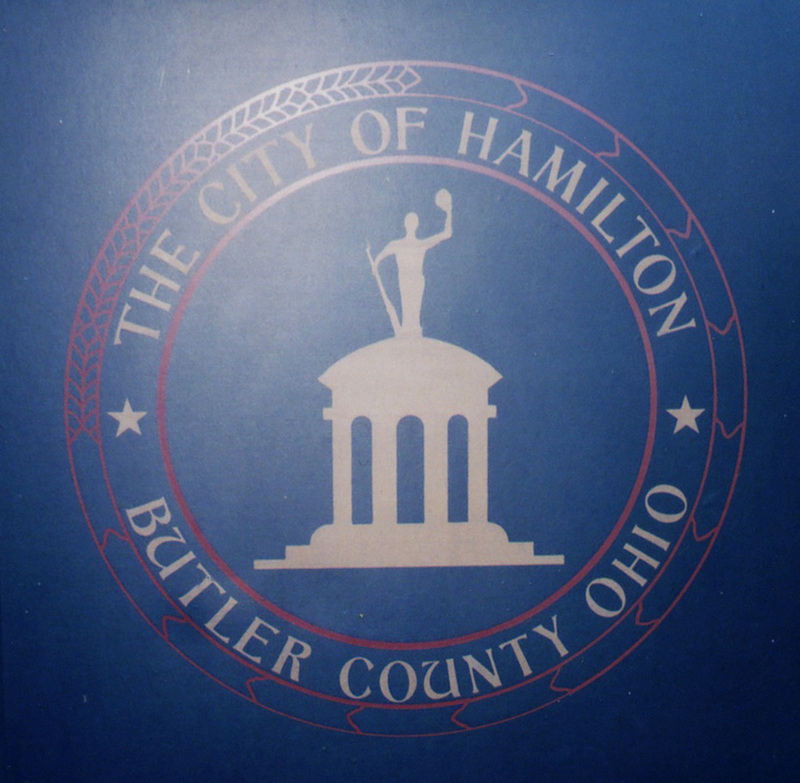 Butler County logo (on a dumpster). 2009. A number of Rudolph Thiem’s sculptural works have been destroyed, stolen, or are no longer traceable. The great Victory statue, however, has withstood the ravages of time. Thiem’s emotional tribute to the common soldier still rises above the banks of the river. Billy Yank is too high up to be stolen, too renowned to be forgotten. Butler County’s Monument Committee opened bids for a bronze statue in 1903. Rudolph Thiem’s submission occurred during a national epidemic of Civil War statuary, much of it mass-produced from the same cookie-cutter pattern. The “statuemania” of the time led the Cincinnati Enquirer to comment in 1887: “It is not impossible that the building of statues is being pressed a trifle too far” (Oct. 29, p. 4). Every town wanted its memorial. Surviving Civil War veterans had begun to reach their sixties. These men felt a keen desire to commemorate the war. Because so many state officials and congressmen of the time had fought in the war, county and state governments showed a willingness to bankroll the projects. This was the context in which the eight aging Civil War veterans of the Monument Committee met to decide who of the four finalists would receive the statue commission. Thiem’s three competitors were nationally-recognized sculptors. Clement Barnhorn (b. 1857) taught sculpture at the Cincinnati Academy of Art. Rudolph Schwarz (b. 1866, Vienna) was a major contributor to Indianapolis’s massive Soldiers and Sailors Monument (1902). Alice Ruggles Kitson (b. 1871, Massachusetts), the only woman contestant, had exhibited four of her works at the World’s Columbian Exposition in 1893, and was the first woman admitted to the National Sculpture Society (1895). The Monument Committee of Civil War veterans visits Thiem’s Studio, April 20, 1904. Photo taken by Chris Schwenn. Courtesy of the Butler County Museum. The Victory statue was successfully cast in bronze by the Hamilton Metal Pattern Works that November. A small army of men hoisted the 3,500 pound soldier a hundred feet in the air to the top of the Monument on December 1st—an achievement in its own right. Hamilton was industrial, and the great bronze statue showed off what the city could accomplish in fine metal casting. A reporter wrote that the statue was “credited with being the largest piece of work of the kind ever cast in the state of Ohio” (“Thiem’s Life” 5). He also wrote that the victory the soldier “proclaimed” included the “victory of modern achievement, through art and manufacture and engineering . . . .” (“Thiem’s Life”). Those who have questions or comments about Rudolph Thiem and “Billy Yank” can contact Jon Thiem through the Contact page of this website. While researching a book-length study of Rudolph Thiem’s life and times, Jon has come across new material that throws further light on the statue and its genesis.